A small but highly informative museum, chock-full of artefacts and interesting stories, located at the foot of Jacob's Ladder in Lower Jamestown, the “capital” of St Helena, South Atlantic. More background info: for general historical background to the island as such see the main chapter on St Helena. The museum goes back to a rather informal predecessor from the 19th century, but wasn't established as a proper museum called the St Helena Museum until 1980, after the formation of the St Helena Heritage Society six months earlier. It was at a different location, on Broadway, which some two decades later proved too small to display all the artefacts the museum had collected over all those years. Eventually a new location was found in the form of the old power station near Grand Parade. The new museum was opened by the governor on 21 May 2002, on the 500th anniversary of the first discovery of the island (by the Portuguese). The Heritage Trust (of which the Heritage Society is a member) still occupies the old Broadway House. The museum (or rather the Heritage Society that runs it) also has an extensive archive and apparently there are plans to expand into the neighbouring building to form a one-stop cultural centre for St Helena. What there is to see: The museum is housed in an old sturdy stone building (a former power station) and its first exhibit stands outside: an old cannon. Cannons are a common sight on St Helena, of course, and indeed there are more old barrels lying around the back of the museum too (see the separate forts and cannons chapter). The museum appears rather small, and that expectation is further amplified by the somewhat gloomy reception area, which also doubles up as a well-stocked souvenir shop. But once you step into the exhibition you see it's actually on two levels in a rather airy hall, and everything on display is quite densely packed. So there is a lot to see here. The exhibition's design is old-school. Plenty of artefacts accompanied by explanatory text panels. None of the multimedia installations and interactive touchscreens that seem to be so de rigueur in modern European museums these days. Call me old-fashioned, but I prefer the traditional museum style. I'm sat in front of a screen so much of the time – like right now as I am typing this – that I don't really like museums recreating my workspace. 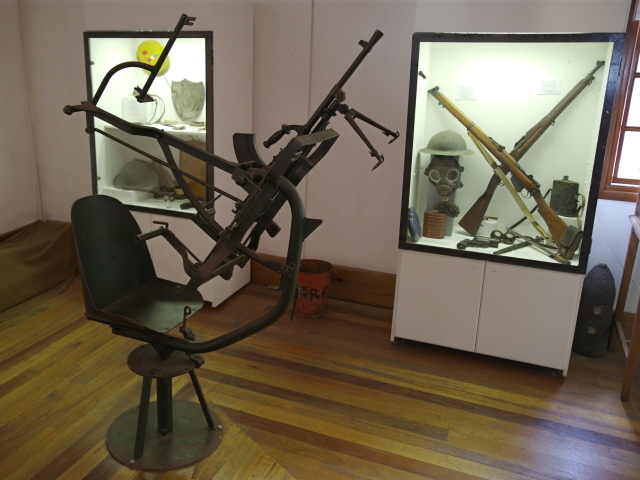 The thematic coverage of the St Helena Museum is far wider than I had expected. Obviously not all sections are as interesting to everybody. For instance, not being much of a botanist or birder I only skimmed the sections on endemic flora and fauna. Except one part of this had a dark angle: termites. Some of these little creatures (locally also known as 'white ants') had come to the island on a ship from Brazil, and this proved disastrous in the 19th century, when they wreaked havoc on the timbers used in construction on the island. Many buildings actually had to be rebuilt (now with steel girders rather than wooden beams) … and the little critters didn't spare the contents of the public library either. The museum covers this part of island history accompanied by the exhibit of an old termite nest that was found in the stump of a tree. Many of the museum's different sections are on not-so-dark aspects of island life and culture, and some of them are really more of local interest but not for the dark tourist (such as schooling, religious life, and such things), though some are darkish in the sense that they illustrate the sheer isolation of St Helena and the hardships that used to bring in the past. For instance “getting around”. That really used to be an issue on this rocky and often steep terrain … so transport/travel was mostly on foot or by donkey. Until roads and cars arrived, that is. One exhibit is a photo of the very first motor car on the island …. today there almost as many cars as people on St Helena. An interesting – and physically interactive – exhibit is a model of Jacob's Ladder as it was when it was still a funicular for transporting goods up to Ladder Hill Fort (see under Jamestown). You can turn a little wheel to make it move. By the way, the tracks for the funicular also fell victim to the white ants (termites), that's why it is now just the steps. St Helena's maritime history naturally also has its distinctly dark aspects, in particular shipwrecks. 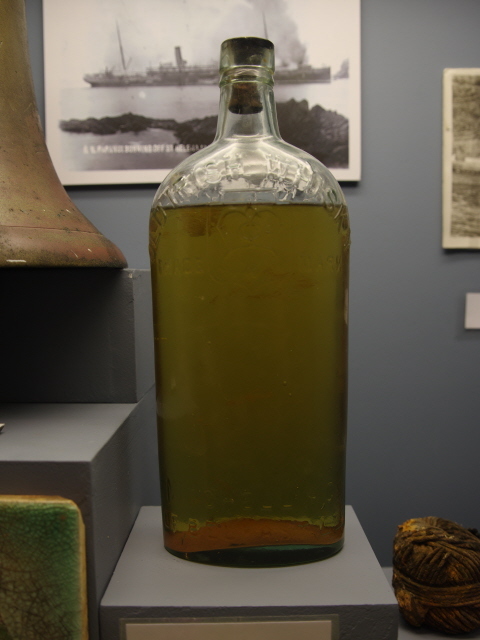 This is amply illustrated, for instance, by artefacts, including a still almost full bottle of whisky, salvaged from the “SS Papanui”, which was wrecked in 1911 in James Bay after a fire … from Jamestown's seafront you can still see a bit of the vessel poking out of the water. Dark themes on land include the military, police and crime, and the various exiles on St Helena. The military presence on the island is woven into St Helena history at every turn and features in manifold forms in this museum, from uniforms to photos of fortifications and military barracks and whatnot. Another intriguing crime-related story is that of Dutchman Willem Merk, who was imprisoned on St Helena in 1991 for trying to smuggle marijuana from Brazil to the Netherlands, but in 1994 escaped and managed to sail a tiny makeshift dinghy back to Brazil from where he was repatriated to his homeland (where his sentence would have been much milder so he couldn't be extradited under Dutch law). Or at least that's the commonly agreed story, though some doubts about its credibility remain … (see here – external link, opens in a new window). The exiles section obviously features the most famous one of them all: Napoleon, banished to St Helena in 1815, where he died in 1821 (see the Napoleonic sites chapter for more details). Other exiles are also covered, though, such as Zulu chief Dinizulu who, together with some relatives, was exiled to St Helena in 1890, or the final exiles/political prisoners on the island, the three Bahrainis – see Munden's. The most interesting of the exiles section, though, I found to be that on the Boer POWs, brought here in their thousands during the Second Boer War of 1900-1902. Though they were housed in two large tented camps they fared much better than those crammed into the world's first concentration camps, set up by the British, on the South African mainland. In fact, the Boers greatly contributed to the island's development, e.g. in construction and manufacturing of goods such as pipes, wooden boxes and a range of decorative items, of which the museum has a good number on display. Upstairs, the museum has a section about war – both WW1 and WWII, in which some St Helenians fought, but the island itself escaped any role in actual battles – except that in 1941 a British tanker was torpedoed by a German submarine and sank in James Bay. St Helena got indirectly involved in war much later, namely in the Falklands War of 1982. When this conflict broke out, the supply ship “RMS St Helena” was requisitioned by the Royal Navy and refitted as a minesweeper support ship. By the time she entered service the fighting was already over, but the mine clearing continued into 1983, and only after that was the island supply service resumed. The museum has another model of this first RMS St Helena as she looked during her service in the waters around the Falklands, also various medals, photos, special release postage stamps on the Falklands theme and so on. In a corner of the mezzanine part of the museum is a large table where you can sit and browse various publications. Amongst those are printed magazines including various issues of the Tristan Da Cunha Newsletter – providing some insights into that even more remote island's goings-on. Finally, one especially dark period in global history is covered here too: slavery. St Helena played a role in this in more than one way: first as a supply post for slave trade ships, and with some slave trading taking place on the island itself (see under the general St Helena chapter), and later, after Britain abolished and outlawed the slave trade the Royal Navy hunted down slave trade ships and used St Helena to put many freed slaves ashore. The museum shows various items from the recent archaeological digs at Rupert's (see the link and photos in the St Helena chapter), where many of those slaves were taken, as well as (part of?) a special exhibition about St Helena and slavery from the International Slavery Museum in Liverpool. All in all: I was very impressed with this museum, much more so than I had expected. Absolutely not to be missed when on St Helena. I found it much more engaging than the other proper museum on the island, Longwood House (see under Napoleonic sites), or the tour at Plantation House. Location: in the northwesternmost corner of Lower Jamestown just round the corner from Grand Parade and Castle Terrace just steps from the bottom of Jacob's Ladder. Access and costs: Easy to get to from within Jamestown, free. Details: The location is easy enough to find: Jacob's Ladder, visible from so many parts of Jamestown, points the way: the entrance to the museum is just a few yards from the bottom. Opening times: Monday to Friday 10 a.m. to 4 p.m., Saturdays 10 to 12 noon, closed Sundays. Time required: Don't underestimate this little gem of a museum. It may look small from the outside, but it is like a Tardis: much bigger on the inside, or rather: so full of exhibits that you'll need quite a bit of time to go through it all. I spent a lot longer in there than I had anticipated, between an hour and a half and two hours … and I could have spent much longer than that had I read all the texts and inspected every exhibit in detail. Instead I was a bit selective. So either do the same or allow a good few hours. Combinations with other dark destinations: see under Jamestown and St Helena in general. Combinations with non-dark destinations: in general see under Jamestown and St Helena. One additional reason to visit the museum – but without going through the exhibition – is to collect your certificate after having climbed Jacob's Ladder (and descended back down). I didn't bother with this at the time, as I had visited the museum before attempting the climb and when I did it was outside the museum's opening hours. But when I contacted them to ask how much the fee for the certificate is, they granted me it in retrospect, and sent me the certificate as an electronic file for free (partly in recognition of me raising the island's profile a bit, and partly since collecting the money from abroad would have been impractical). The regular fee is 2.50 GBP.